Assalamualaikum everyone. This is an amazing opportunity for us to build Jannah, Wallahi. Whoever is able; please visit this website and invest with Allah. This charity is trustworthy, and the brothers and sisters running it know the burden of responsibility they carry with receiving your trust & donations. Many of the these students are orphans as well and we have heard time and time again the rewards for looking after an orphan! 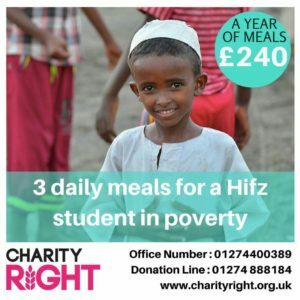 How much would you pay for one meal in Jannah? How much would you pay to have a chance to be next to the Messenger (SAW) in Jannah? Its really a small amount of money that will have an impact across the entire year! Allahu Akbar! If you don’t have the money; raise it – This is a ‘no brainer’ brothers and sisters. I love you for the sake of Allah. Let’s build Jannah together :).